Want to have a good Sunday? Starting the day with some form of workout is one way to go about it. 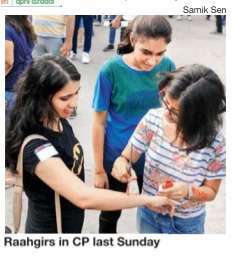 Head to CP's Raahgiri for some of the coolest workout sessions in the city. There's the aerobics and zumba workout by Yog Youngis tan, and for those who want a milder workout can participate in the laughter yoga by the Malviya Nagar Laughter Club. You can also at tend the instru mental music, beatboxing and dance per formance by the arts and cultural society of Zakir Husain College at the TOI stage. Enjoy some more band performances by Gaurav Kumar and Shashank & Ujwal Group or hone your acting skills at the Acting Ka Funda session by Shake Hand.You can also attend the comedy show by Sandeep Kumar and laugh a little more.Dance enthusiasts can also participate in the bhangra session by Bhangra Destiny or watch the dance perform ance by Fitco. There's also a nukkad natak by Sasakawa Leprosy India Foundation and a yoga and meditation session by Atre Yoga Studio.